The kids are having half days at school yesterday and today to fit in parent teacher conferences. I think this means that there will be no full weeks of school in the month of November - we lost two days to Hurricane Sandy, two days to the election, 2 half days for parent/teacher conferences and next week will be Thanksgiving. Edda's teacher this year is so upbeat, so energetic, so on top of everything - it makes me kind of want to cry with relief. And also after such a moody summer with Edda, it's good to hear that she is awake and happy and participating in her own way. The teacher's big challenge this year is to do the Alternative-MSA for Edda. MSA is the standard testing that all the kids in the county have to take to determine their skill levels in reading and writing - I think it is given every year from 3-8th grade (I know! Overkill - even for the typical kids.) She is to be tested on grade level material - modified especially for her. I can't decide if it is a complete waste of time that the test is modified so much that it is meaningless or if it is a good thing for Edda and her classmates. With Edda's enthusiastic teacher and her can-do attitude, I can only see the upside for Edda and her amigos. Vince is doing just fine - writing is still a big weakness, not doing more than the bare minimum is also a weakness, but he's interested in reading, in participating, and eager to be at school. All good things. 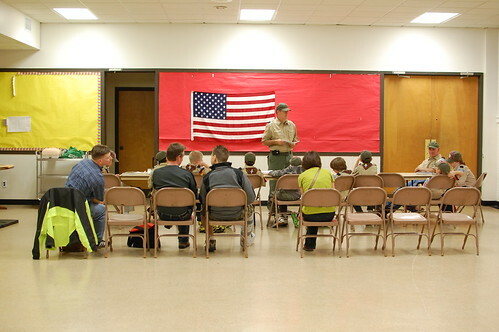 And last night, he learned some first aid at the den meeting at cub scouts. They had some pictures of people with frostbite and somehow the photo ended up in front of him and at some point, he was so freaked out that he had to find me in the parents section to snuggle. I flipped the photo over.